From whom we're all of us descended. All, all amoebas still are he. From him alone were evoluted. Derived from that same bit of jelly. (1922). Collected in Gaily the Troubadour (1936), 18. Antoine Magnan, a French zoologist, in 1934 made some very careful studies of bumblebee flight and came to the conclusion that bumblebees cannot fly at all! Fortunately, the bumblebees never heard this bit of news and so went on flying as usual. As quoted in David Phillips, Biographical Memoirs of Fellows of the Royal Society (Nov 1979), 25, 132, citing: Perutz, M.F. 1971 New Sci. & Sci. J. 8 July 1967. If these d'Hérelle bodies were really genes, fundamentally like our chromosome genes, they would give us an utterly new angle from which to attack the gene problem. They are filterable, to some extent isolable, can be handled in test-tubes, and their properties, as shown by their effects on the bacteria, can then be studied after treatment. It would be very rash to call these bodies genes, and yet at present we must confess that there is no distinction known between the genes and them. Hence we can not categorically deny that perhaps we may be able to grind genes in a mortar and cook them in a beaker after all. Must we geneticists become bacteriologists, physiological chemists and physicists, simultaneously with being zoologists and botanists? Let us hope so. 'Variation Due to Change in the Individual Gene', The American Naturalist (1922), 56, 48-9. In a sense, genetics grew up as an orphan. In the beginning botanists and zoologists were often indifferent and sometimes hostile toward it. 'Genetics deals only with superficial characters', it was often said. Biochemists likewise paid it little heed in its early days. They, especially medical biochemists, knew of Garrod's inborn errors of metabolism and no doubt appreciated them in the biochemical sense and as diseases; but the biological world was inadequately prepared to appreciate fully the significance of his investigations and his thinking. Geneticists, it should be said, tended to be preoccupied mainly with the mechanisms by which genetic material is transmitted from one generation to, the next. 'Genes and chemical reactions In Neurospora', Nobel Lecture, 11 December 1958. In Nobel Lectures: Physiology or Medicine 1942-1962 (1964), 598. In my opinion the separation of the c- and ac-stars is the most important advancement in stellar classification since the trials by Vogel and Secchi ... To neglect the c-properties in classifying stellar spectra, I think, is nearly the same thing as if a zoologist, who has detected the deciding differences between a whale and a fish, would continue classifying them together. Letter to Edward Pickering (22 Jul 1908). 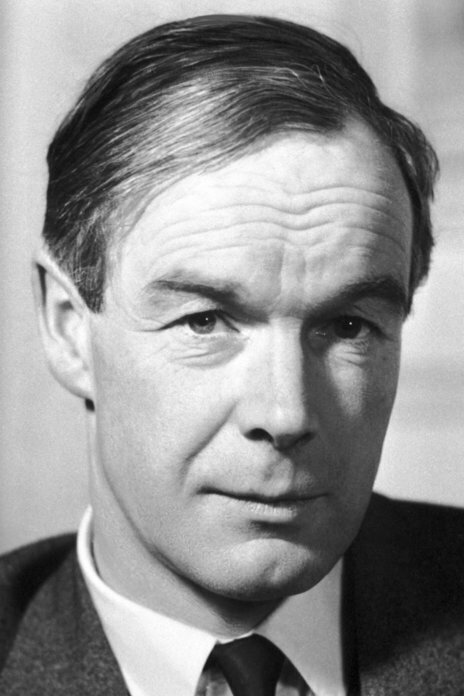 In Charles Coulston Gillespie (ed. ), Dictionary of Scientific Biography (1974), Vol. 9, 194. 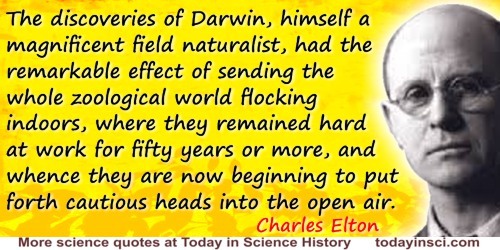 The discoveries of Darwin, himself a magnificent field naturalist, had the remarkable effect of sending the whole zoological world flocking indoors, where they remained hard at work for fifty years or more, and whence they are now beginning to put forth cautious heads into the open air. The wisest decision I ever made with regard to science, I made as a child. In the summer of 1932, shortly after my thirteenth birthday, I decided to become a zoologist, because I thought it would be fascinating to visit distant parts of the world and study exotic animals. I was right. It has been. In 'Integrative Biology: An Organismic Biologist’s Point of View', Integrative and Comparative Biology (2005), 45, 332. 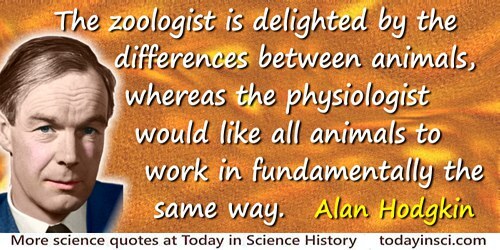 The zoologist is delighted by the differences between animals, whereas the physiologist would like all animals to work in fundamentally the same way. Chance and Design: Reminiscences of Science in Peace and War (1992), 66. When chemists have brought their knowledge out of their special laboratories into the laboratory of the world, where chemical combinations are and have been through all time going on in such vast proportions,—when physicists study the laws of moisture, of clouds and storms, in past periods as well as in the present,—when, in short, geologists and zoologists are chemists and physicists, and vice versa,—then we shall learn more of the changes the world has undergone than is possible now that they are separately studied.